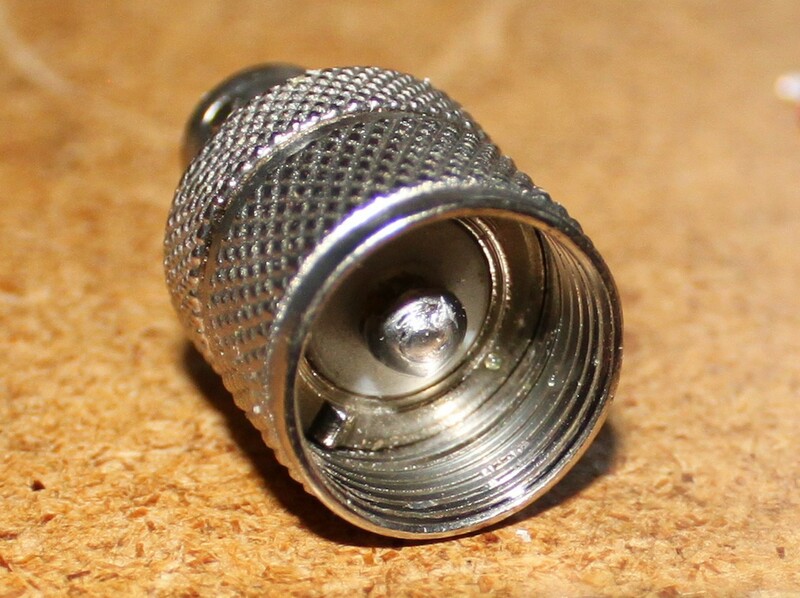 I found out online that I could cut the center pin in a PL259-BNC adapter down to about 1/4″ and that would fit the funky knight connector. So I did that. I actually cut it down a little too far, but some solder deposited on the stub of a center pin managed to make up the difference. The adapter worked. However, it turned out to be a really stupid idea. I spent ~ $7 making this ugly adapter when I could have just bought some BNC jacks from digikey (P/N A97548-ND) and replaced the jacks in the signal generator with modern BNC jacks. I did that, at $1.74 per jack. They fit perfectly, and now I can attach modern test leads to the old RF generator without any issue. While I had it torn apart, I replaced the filter capacitor, because old filter capacitors are prone to failure. This modification is a bit controversial, as it now means the KG-650’s BNC jacks are grounded. 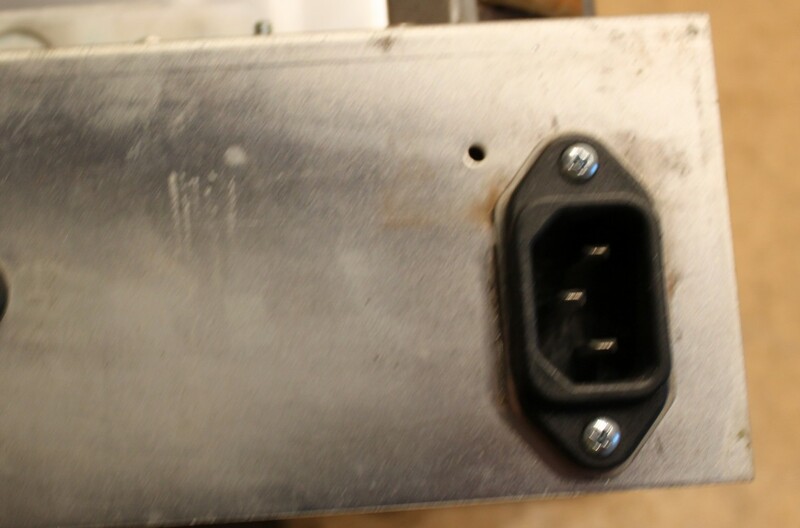 Some radios are hot chassis and non-polarized, which means one could encounter a radio with 120 VAC on the chassis. It would be really bad to connect a test lead ground to that. 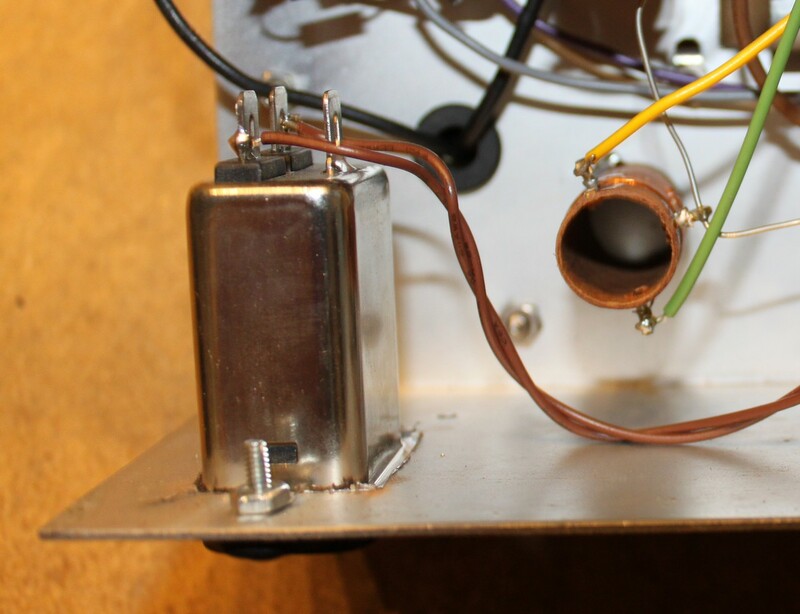 The answer is to use an isolation transformer on the radio under test — you really ought to be doing that anyway. However, it’s conceivable that one day a guy could forget, and turn some perfectly good test leads into a short-lived welder. Next it was time to take a look at the output of this wonderful RF signal generator. Here are some screen shots using my Rigol DS-1052E. The yellow trace is connected to pin 3 of the 12AT7 tube (i.e. upstream of the RF attenuator) and the blue trace is connected to the pin 6 of the 12AT7 tube. The yellow trace approximates what you’ll see on the output of the instrument. Holy Crap! What’s going on here? Those first two plots at Bands A and B are atrocious. The output vaguely resembles a sine wave, but it all truncated and crappy. At lease band C and D look a little better. NSE Labs at https://nselabs.wordpress.com/2015/03/01/knight-kg-650-improved/ reports similar problems with the KG-650, and resolved the issue by inserting a 2M pot between C8 and pin 6 of the 12AT7. The idea is that mixer stage of the 12AT7 is being over-driven. I have a 2M pot on order and am going to give this a shot. I expect similar results on Bands A and B, but I do wonder what the effect will be on bands C and D, whether the signal will be too low to be usable at those frequencies. Band E could not be resolved with the ’scope. Maybe something is broken. I read with interest your mods to the kg-650, as I have recently purchased one also. I know very little about hollow state repair and nothing about solid state, and am just a hobbyist newbie at this point. I am still collecting my diagnostic equipment at this stage. I can’t find a manual for the 650, not even BAMA. They are out of print and should be public domain, but people are selling them for about $25. I was able to get the schematic from BAMA. Don’t know if you could help me with a few questions? 1)Is the filter cap the 470 MMFD? 2)When you ’scoped the 650 via the 3 pin (12AX7, yellow trace) and 6 pin (12AT7, blue trace) would this have been done using 2 separate channels? I have a Tekronix 2246A scope but haven’t used it yet, so I’m trying to figure how to do the same test you did. And finally 3)what is a 2M pot? I’m curious if that helped with the 12AX7 being over driven, and perhaps a little more detail of the installation. Thanks so much for your posting this information! The filter capacitor is a pair of 20uF capacitors with a 2.7K resistor between them. It’s marked C3 on the schematic. 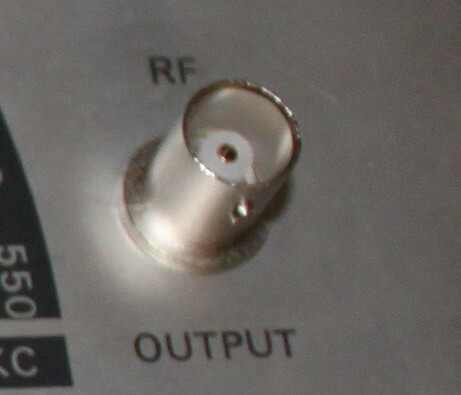 While these are technically two separate capacitors, old radios will often locate them in the same metal can. It’s been a while since I tore into my KG-650, but I think this was the case. Yes, I did use two channels on my scope (I have a rigol DS 1052 digital scope). 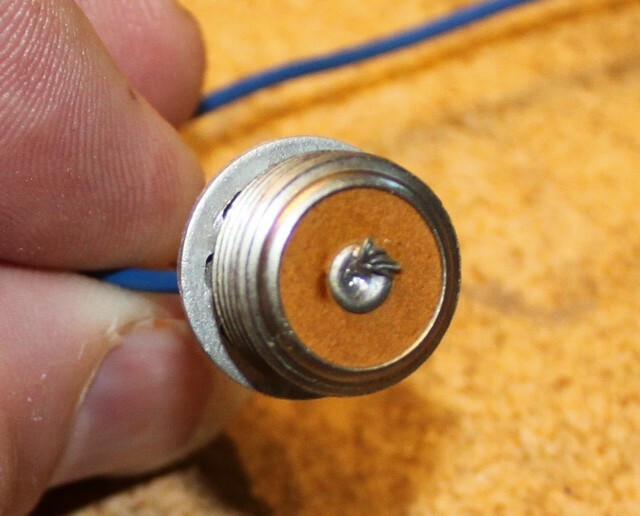 “pot” stands for potentiometer, and 2M means 2 megohm (2,000,000 ohms). I haven’t modified mine with the pot, though I do plan on trying it out. Basically the idea came from the NSElabs blog post that I linked in my blog post. It seems like a good idea, though while I think it’ll correct the overdrive, it might lead to an underdrive situation in other bands. 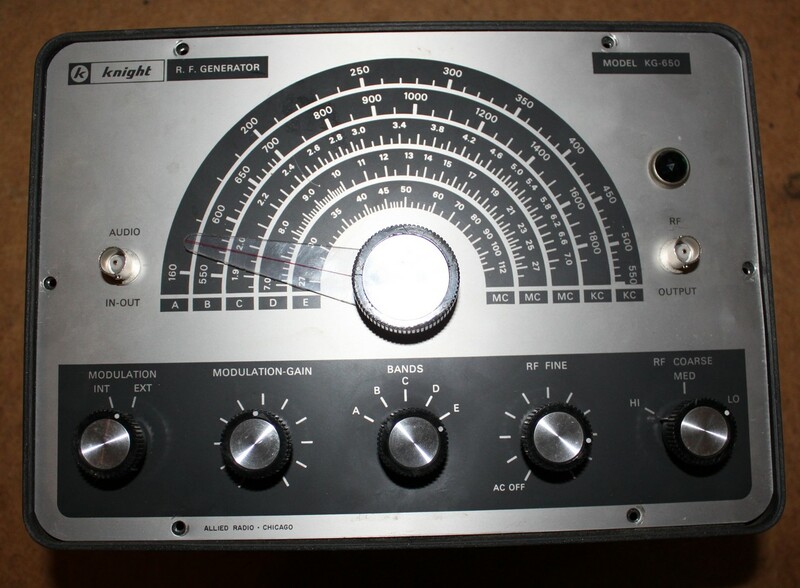 Unfortunately, these old tube-based RF generators can be pretty mediocre when compared to a modern solid state design. I’m currently building a solid state RF generator described in the June 2014 issue of nuts and volts, and so far it seems a lot cleaner and more versatile than the KG-650. Do you have a copy of the KG-650 manual that you could email me?